In 1993, Richard Nerurkar won the IAAF World Cup Marathon in San Sebastian, before going on to place fifth over the distance, both in the 1996 Olympics in Atlanta and in the London Marathon in 1997, the latter in a PB of 2:08:36, which remains No.4 in the UK all-time rankings. For both of those events Nerurkar worked off a two-week hard, one-week easy training programme. Between 1989-1996, he did most of his training on his own from his Marlborough base. Coached by Bruce Tulloh, the 1962 European 5000m champion, Nerurkar trained predominantly on the town’s cinder track. “Bruce used to run the odd 200m effort in and amongst my reps and amazingly he could still scamper round at 66sec pace in his 60s,” Nerurkar says. After the 1996 Olympics, Nerurkar married and moved to Teddington. Throughout his career, his training philosophy was three-fold: (i) learn from the best and apply it the best you can in your own situation, (ii) do all you can to avoid injury and (iii) remember training should always be race-specific: start with what is required in a race and work backwards. In the years when he was racing over 10,000m in the summer, one of Nerurkar’s killer sessions was 1000m with three minutes recovery, 3000m with five minutes recovery, 2000m with five minutes recovery, 3000m with five minutes recovery and 1000m. After moving up to the marathon, Nerurkar’s killer sessions tended to be the long runs and the tempo runs, some of which involved changing pace, for example, a 15km pace run with a 2km effort at a pace of three minutes per km followed by 1km at a pace of 3:20min per km. A month before he won the World Cup Marathon, he did a 16km tempo run in Font Romeu, increasing the pace every 5km. To get through the gruelling training sessions, Nerurkar used to think about maintaining good running form, staying relaxed and controlling his effort. “On occasion, I would think how and when I would drop my training partners,” he says. 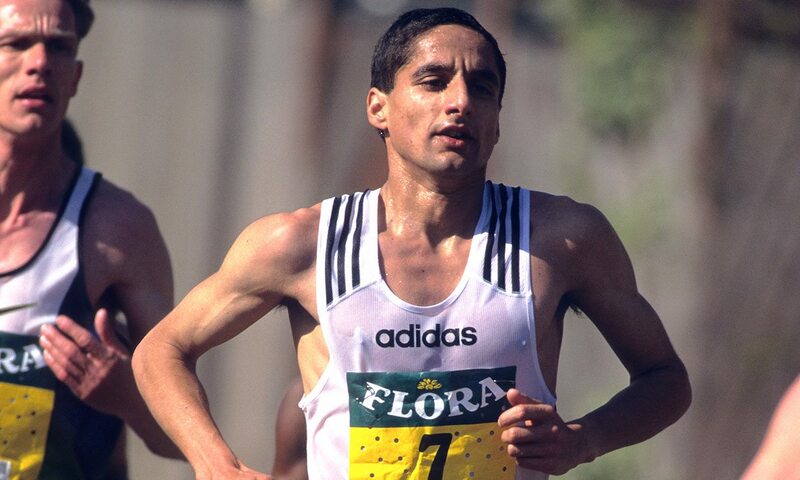 Good nutrition was key for Nerurkar, and he would ensure he had enough fluids including carbohydrate drinks, before and during training, particularly when at altitude. Afterwards, he would eat lots of carbs, including in the first 30 minutes post-exercise. “I didn’t know back then the importance of protein for muscle recovery,” he says. He admits he gained much from training camps and particularly enjoyed training at altitude. “I loved being in the mountains – still do – and thrived on high mileage, sunshine, good food, and the fun of training with others and the focus of training camps,” Nerurkar says. Now manager of the Great Ethiopian Run, Nerurkar is quick to credit the team that saw him achieve so much in the sport. “I could not have done what I did without a good team around me, starting with my coach and adding a number of others who helped in many different ways,” he says. 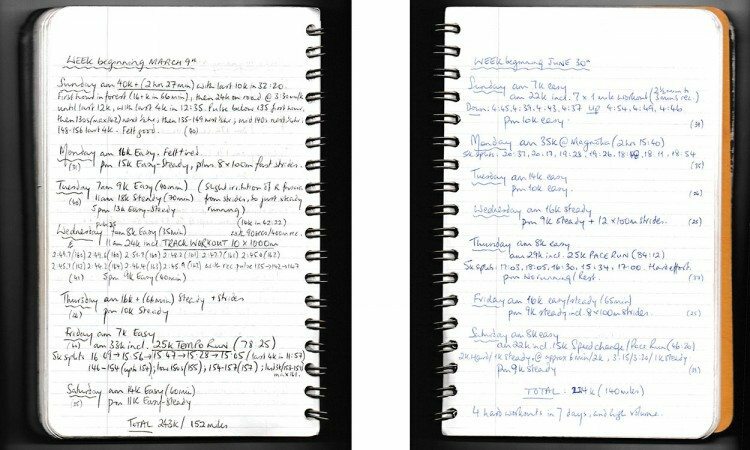 Below is the March extract from his training diary that recounts a period of training in Terrenia, Italy in the lead up to the 1997 London Marathon. “Don’t over-read the pages from my training diary. I’m showing you the ‘me at my best’, the ones I’m most proud of in terms of giving it my all,” Nerurkar stresses.